A race almost three months in the waiting, the 2012 Budweiser Shootout launched the NASCAR Sprint Cup competition with a non-points event. Bringing the new fuel-injected V-8 engines of the world's most premier stock car series to life, the Daytona International Speedway plays host to an annual event that combines the accomplishments of the previous season with a perspective towards the upcoming season. The scheduled 75-lap event brought 25 selected drivers into a Saturday night fight for a purse just over a million dollars as well as the all-important begging rights entering the following Sunday's Daytona 500. Michael Waltrip Racing's #56 Toyota piloted by Martin Truex Jr led the 25-car field to the 2012 NASCAR Sprint Cup season's first green flag (although unofficial). After several rule changes designed to eliminate last year's prevalent 'two-car tandem' drafting at restrictor plate races, the first major competition at Daytona International Speedway saw the multi-car packs return as the main method for lapping the 2.5-mile oval. The racing action immediately became anxious as the Budweiser Shootout saw drivers frequently going up to three-wide. At the front of the Budweiser Shootout early, Truex Jr's pole advantage was nullified by the #88 Chevrolet of Dale Earnhardt Jr surge from a 7th place spot to the lead in the first lap. In addition to Earnhardt Jr, drivers Joey Logano, Jamie McMurray and Kevin Harvick also possessed the top spot across the Daytona start/finish line within only the first 10 laps. 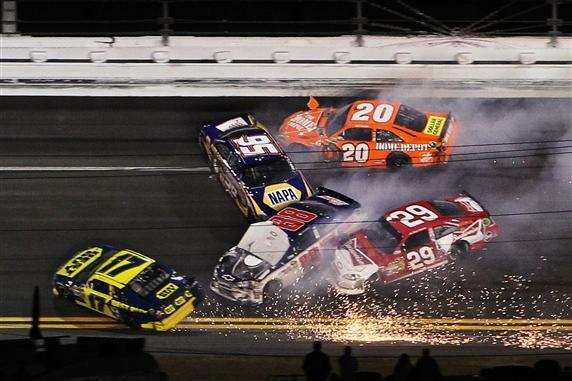 A wild race within 25 cars, the Budweiser Shootout competition would be reduced early by an accident on lap 9. Through turn 2, the #34 Ford of David Ragan and Paul Menard's #27 Richard Childress Racing Chevrolet made contact that caused a chain reaction wreck collecting 9 cars. Among the vehicles damaged in the race's first caution was the #11 FedEx Toyota of Denny Hamlin, Jeff Burton's #31 Chevrolet and the #55 Toyota driven by Michael Waltrip. Of the five cautions for the night, three (including the lap 9 altercation) would be for multi-car accidents. A race divided into two segments (first a 25-lap and second a 50-lap stint), the NASCAR Sprint Cup racers aggressively ran through the initial 25 laps. Showing some considerable speed, the #1 Chevrolet piloted by 2012 Daytona 500 winner Jamie McMurray made the most of his Earnhardt-Childress Racing engine once again at Daytona. With a 10-minute break for teams to tune their cars for the final 50 laps, the race was wide-open for any competition (or situation) to win out. Similar to the first racing segment, the second part of the 2012 Budweiser Shootout would involve rapid lead changes. Coming strong in the first 25 laps, Jeff Gordon's #24 Chevrolet took the lead in the second segment's first lap. The #16 Roush-Fenway Racing Ford of Greg Biffle and AJ Allmendinger, driving the #22 Dodge for the first time in competition for Penske Racing, added their names to the leader board of the event. Having started alongside Martin Truex Jr on the front row after the Budweiser Shootout qualifying draw Friday, the #18 Joe Gibbs Racing Toyota in the hands of Kyle Busch remained quiet during the event until a wild slide on lap 47. Sent sideways, Kyle Busch showed off some brilliant car control by saving his M&Ms-sponsored race vehicle avoiding major damage and a caution. Through the latter stage of the event, Busch and the #18 Toyota involved deeply in the action of the 2012 Budweiser Shootout. 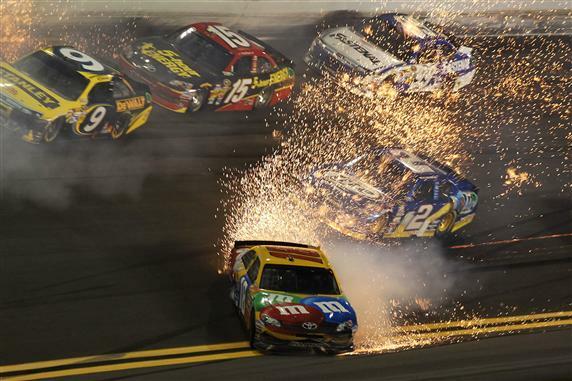 With a big wreck at lap 9 of the Daytona event, the NASCAR Sprint Cup Series competitors were once-again to be swept by a major accident in turn 2. When the #9 Ford of Marcos Ambrose tagged Joey Logano's #20 Toyota, the ensuing accident collected several front runners. The #17 Ford of Matt Kenseth, Kevin Harvick and Dale Earnhardt Jr were all finished for the night following major damage from the wreck. As the field of the Budweiser Shootout thinned after two major restrictor plate accidents, there was still a considerable pack of NASCAR Sprint Cup cars in position for the 2012 edition of the event. 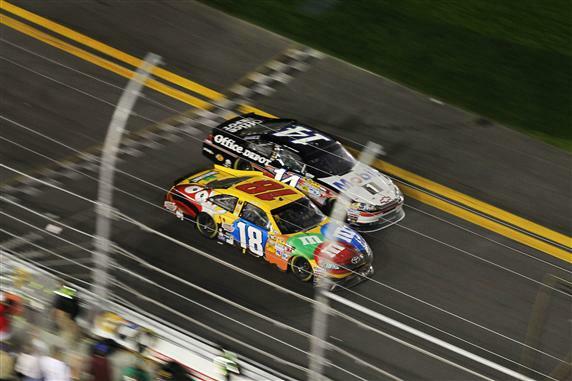 With just a handful of laps remaining, almost every race car remaining stood a chance of taking the 2012 Budweiser Shootout at Daytona but Jeff Gordon, Kyle Busch and Tony Stewart appeared to be primed as favourites within 2 laps to go. Entering into turn 3 on lap 73, Kyle Busch was sent sideways once more by an aggressive Jeff Gordon. While Busch chased control in his #18 machine, the contact ﻿created a chain reaction that swept up 8 cars. Among the vehicles caught up included Gordon's #24 Chevrolet that flew into the turn 4 wall, was lifted onto its side and sent burrow-rolling down the frontstretch. Landing upside-down, Jeff Gordon﻿ carefully climbed out of his Hendrick Motorsports car unhurt. This second-to-last lap wreck also ended the Budweiser Shootout for Jamie Mcmurray, the #48 Chevrolet of Jimmie Johnson and Kurt Busch Piloting his first race with the Phoenix Racing #51 Chevrolet. Once the accident scene was cleaned up, NASCAR issued a green-white-checkered restart to the field of 10 lead lap cars. Tony Stewart led the group to the final green flag of the 2012 Budweiser Shootout and was immediately placed under attack by the multi-car drafting trains. On the final lap, 2011 Watkins Glen winner Marcos Ambrose received credit for the lead. However, it would be a fight between Tony Stewart and Kyle Busch off the final corner on the final lap that would settle the Budweiser Shootout at Daytona. Skillfully holding onto the #18 Toyota from near accidents twice, Kyle Busch placed himself along the passenger side of Stewart's #14 Chevrolet en route to the checkered flag. To the line, Busch ended a fantastic Saturday night performance by inching Tony Stewart by a 0.013-second margin (The closest ever in the Budweiser Shootout event's history). Behind Tony Stewart, Marcos Ambrose, Brad Keselowski and Denny Hamlin rounded out the top-5 for the Budweiser Shootout. With 13 of the 25 cars classified as running at the end of the Budweiser Shootout, question now exist on whether the return to large drafting packs could be done in a safe manner for the Gatorade Duel 150s or the Daytona 500 race. What may come into play is the Budweiser Shootout differs from the Daytona 500 as a non-points sprint event where there was little to lose by taking chances. The Daytona 500 is a far more methodical event that is prepared to run February 26th as the official beginning of the 2012 NASCAR Sprint Cup season.